During the Christmas equity rout the VIX climbed above the 35 level. Since then the move lower has been rather extreme. The entire explosion in volatilities has been replaced by a huge implosion in the VIX, note how the move lower has been even more brutal than the panic move higher. We outlined our logic on volatility in out post last week, Gamma is King, basically arguing that the panic has gone too inverted. 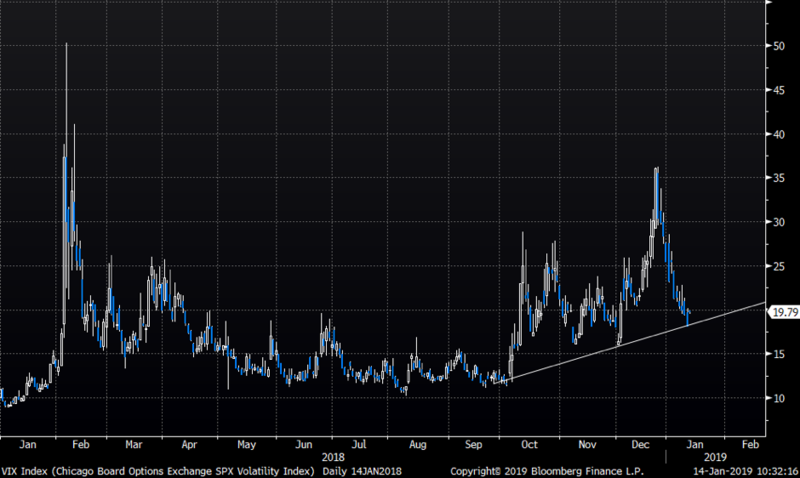 VIX has moved from 35 to sub 20 very quickly. 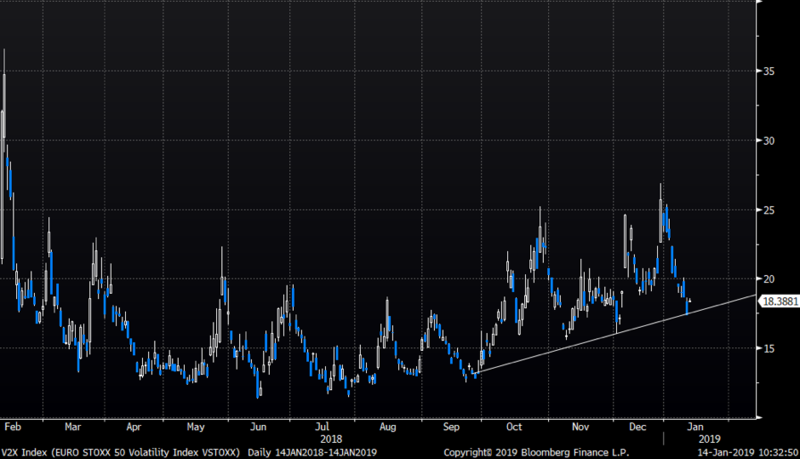 Although the longer-term average of VIX is lower, current macro and political landscape have too many risks for the VIX to trade at the longer-term average. Note the VIX trades up 10% in early pre-market trading today. European VIX, V2X, has also come off lately, but the moves, both up and down, have been less violent than the “crazy” VIX. 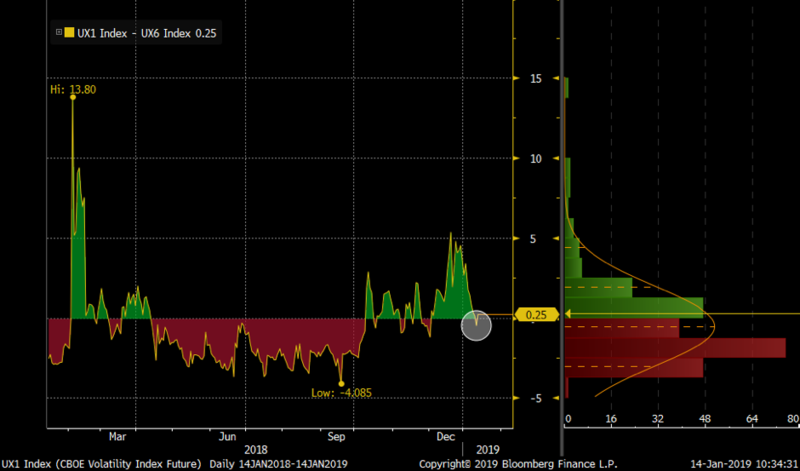 The chart below is showing the 1st versus 6th month VIX futures spread. The spread trades in negative territory when markets are “calm”, and tends to explode into positive territory when markets get “stressed” (investors chase short term maturity options in order to hedge the books for the short term “panic”). Although the spread trades at elevated levels seen as a longer-term average, the current macro environment is simply too “fluid” to not have some hedges on at these levels. The recent implosion in the spread is more an effect of very panicky reshuffling of risk, both ways, where primarily hedge funds running models have been flip flopping in an illiquid market environment. 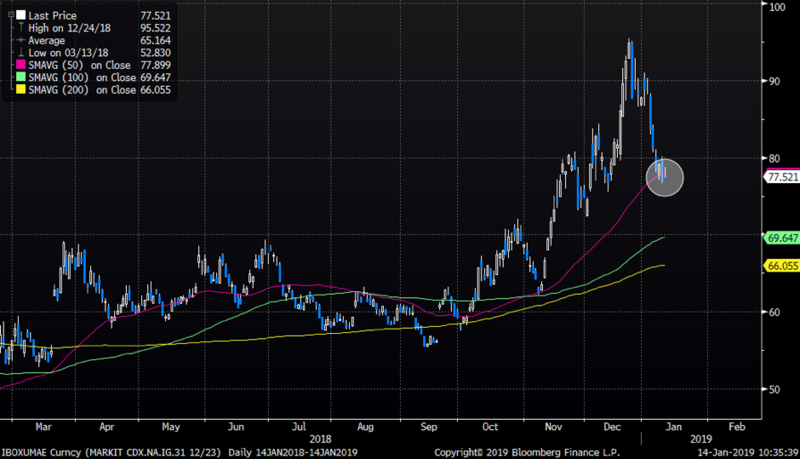 Not only has volatility come off over past weeks (it is up today though), but also the stressed credit space has come off rather aggressively. The recent move lower in credit is also an effect of hedge funds chasing their tails according to us. Note the recent moves in both the US and European main credits. 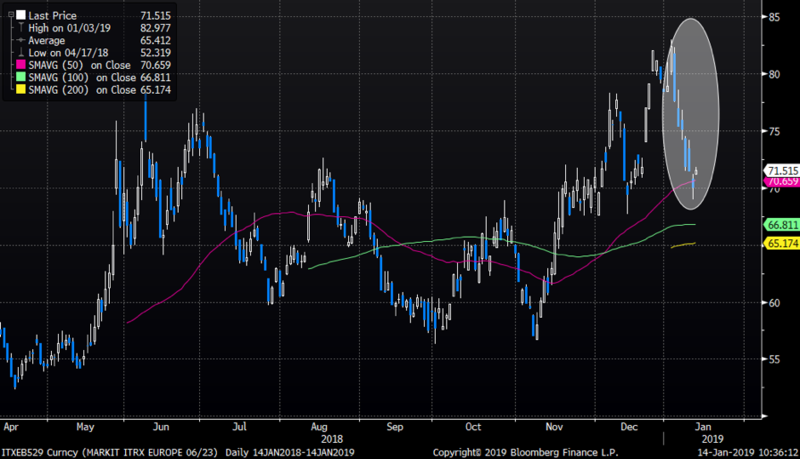 Our shorter-term stance on market direction as well as volatility are explained here and here, but how are the various risk indicators trading in relation to each other here? Below is a chart of European credit (white), V2X (orange) and the Eurostoxx 50 futures (yellow). 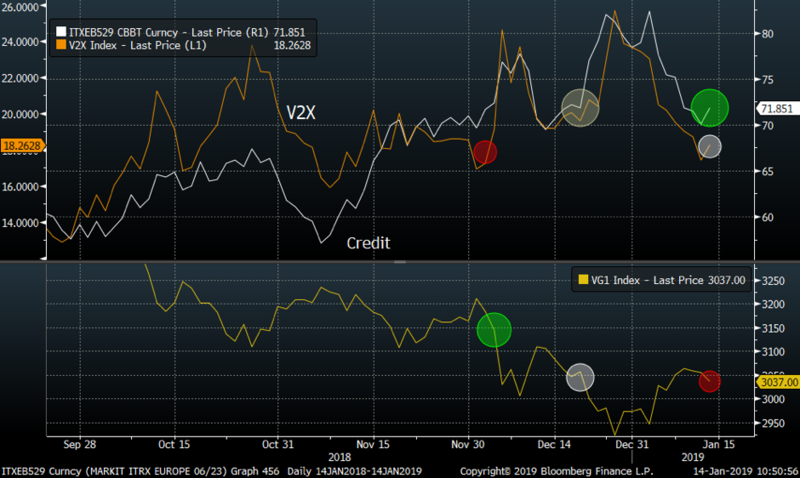 Note that the V2X index has fallen relatively more than credit and last time it traded here Eurostoxx was some 3% higher. Credit on the other hand (iTraxx main) is trading at levels last seen in mid-December, and equity markets traded at approximately theses levels. Given the fact equity markets have enjoyed a huge bounce, the global macro picture is still rather blurred and the fact Q1 earnings are soon to be in focus, we find long volatility strategies once again to offer a good risk reward set up. For the longer-term view on volatility, we strongly recommend to view the latest interview with vol guru Chris Cole of Artemis. For more of his work please visit the link here.